MANAGUA, Mar 14 2015 (IPS) - Nicaragua, the second-poorest country in the Americas, is tapping into its depleted coffers to upgrade its ageing military fleet with costly new equipment from Russia – a move that has sparked controversy at home and concern among the country’s Central American neighbours. The decision was officially confirmed Feb. 10 by the Nicaraguan army chief, General Adolfo Zepeda. When rumours spread in the international media that Managua was seeking to acquire a fleet of six to 12 MiG-29 fighter jets, Zepeda acknowledged that they were looking for warplanes for “defensive” purposes: to intercept drug trafficking flights by cartels in the country’s Caribbean region. He also said the military planned to buy gunboats. No further details were offered. The announcement drew criticism from civilian sectors in Nicaragua and Central America, which argued that the poorest country in the Americas after Haiti shouldn’t be trying to buy fighter planes, which in the case of the MiG-29s cost 29 million dollars apiece. According to World Bank figures, 42.5 percent of Nicaragua’s 6.1 million people were living in poverty in 2009, the last year official statistics were provided by the government. Elvira Cuadra, the head of the non-governmental Institute of Strategic Studies and Public Policy (IEEPP), told IPS that the funds invested in the purchase of Russian planes would be better spent on reaching the Millennium Development Goals (MDGs), a set of development and anti-poverty targets that in the year 2000 the international community agreed to meet by the end of 2015. “The country’s economic situation and especially the vulnerability of certain population groups suffering from poverty and extreme poverty make it necessary to direct all resources and efforts towards resolving this kind of challenge,” she said. Cuadra, a sociologist, said the announcement of the planned military upgrade has generated many more questions than answers. In her view, the government of left-wing President Daniel Ortega is playing into Russia’s geopolitical strategy in its power struggle with the United States. “Some analysts think it’s a game of mirrors, in the sense of (Russia) creating a diversion in this region, which has historically been under the control of the United States, in order to exercise pressure and reach another kind of objective in other regions of the world of greater geostrategic interest to both powers,” Cuadra said. Since the official announcement of the purchase of new military equipment, which followed an agreement signed with Moscow in 2013 to modernise the army and acquire missile launchers and patrol boats, neither the military authorities nor the government have clarified doubts that have been raised about the plan. Nicaragua and Russia established diplomatic ties in December 1944, during World War II, as part of the Allies opposed to the Axis powers headed by Nazi Germany. When the Sandinista National Liberation Front (FSLN) seized power in 1979, after overthrowing dictator Anastasio Somoza, the country forged close ties with Moscow, which armed the new army in the context of the Cold War, while the U.S. financed the “contra” rebels to fight the leftist Sandinistas. Relations cooled off after 1990, when the Sandinistas were voted out of office and the conflict with the contras came to an end. That was until Ortega returned to the presidency in 2007, after heading the government of national reconstruction from 1979 to 1985 and governing as president from 1985 to 1990 as the winner of the country’s first free elections. Since then, Nicaragua has supported geostrategic readjustments by Russia in its zone of influence, on the last occasion backing the Kremlin in the conflict with Ukraine and the annexation of Crimea. Russia has responded to that support with donations and loans of technology, medicine, means of transport and food. The military provisions and cooperation totaled 26 million dollars from 2009 to 2014. Russian warships dock in Nicaraguan ports while its fighter jets land in Managua; and Nicaraguan and Russian vessels patrol the waters of the Caribbean, as a training centre for the fight against drugs is being built in the capital with Russian funds and support from Russian experts. 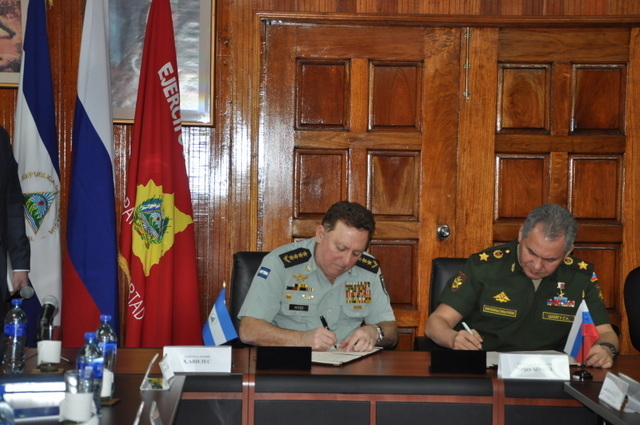 On Feb. 11-12, Russia’s defence minister, Sergey Shoygu, visited Managua with the stated aim of strengthening bilateral cooperation in the area, after his deputy minister, Anatoli Antonov, included Nicaragua on a list of Russia’s three main military partners in Latin America, along with Cuba and Venezuela. Ricardo De León, dean of the Faculty of Legal Sciences and Humanities at the American College University in Managua, said the Nicaraguan army and government are making a mistake by “militarising” their efforts against drug trafficking and organised crime. “It’s a mistake to believe they can fight drug trafficking by buying more arms; El Salvador already showed that police and military capacities are overwhelmed in the fight against transnational narco or crime, with its Mano Dura (Iron Fist) and Super Mano Dura (Super Iron Fist) plans,” the academic told IPS. De León complained that the military purchases took funds away from social spending priorities. “In a country like ours, which is the second-poorest in the hemisphere, this kind of spending should not be included in the budget and future debts like this shouldn’t be racked up,” he argued. 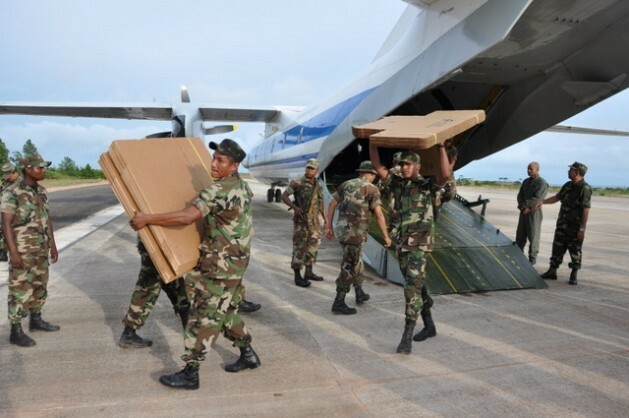 In 2014 defence spending represented 0.54 percent of Nicaragua’s GDP of 11.25 billion dollars, while education spending amounted to 2.94 percent, according to official statistics. The announcement of arms purchases by Nicaragua is causing concern among its neighbours. Government officials and politicians from Costa Rica, Honduras and Colombia warned of a possible rise in violence in the area and a stimulus for an arms race. All three countries have maritime boundary disputes with Nicaragua. The Pentagon does support the security efforts of Nicaragua against organized crime: The U.S. Navy has donated patrol boats to the Navy of Nicaragua, and U.S. SOUTHCOM , just now provided generators for the outposts of Nicaragua’s security forces. The U.S. does have a Navy and a Coast Guard to defend and control its maritime territories, although the USA has refused to sign the “Law of the Sea” (1982) which most nations have signed: The U.S. because it is “exceptional” refuses to recognize the maritime national economic zones of other nations. Nicaraguans have the right to patrol their maritime economic territory as established by international law. (The issue Nicaragua and Colombia has been decided by the an international court). To patrol the expanses jets are obviously more effective and the Russians probably can provide the right planes at the right cost. THE PENTAGON STILL BUYS RUSSIAN HELICOPTERS FOR AFGANISTAN, BECAUSE OF THE OPERATIONAL QUALITIES AND THE RIGHT PRICE !